Felicia R. McMahon breaks new ground in the presentation and analysis of emerging traditions of the \""Lost Boys,\"" a group of parentless youths who fled Sudan under tragic circumstances in the 1990s. With compelling insight, McMahon analyzes the oral traditions of the DiDinga Lost Boys, about whom very little is known. Her vibrant ethnography provides intriguing details about the performances and conversations of the young DiDinga in Syra-cuse, New York. It also offers important insights to scholars and others who work with refugee groups. The author argues that the playful traditions she describes constitute a strategy by which these young men proudly po-sition themselves as pre-servers of DiDinga culture and as harbingers of social change rather than as victims of war. Drawing ideas from folklore, linguistics, drama, and play theory, the author documents the danced songs of this unique group. Her inclusion of original song lyrics translated by the singers and descriptions of conversations convey the voices of the young men. Well researched and carefully developed, this book makes an original contribution to our understanding of refugee populations and tells a compelling story at the same time. Felicia R. McMahon is a research professor in anthropology at Syracuse University. A former Fulbright Scholar, she has published in several folklore journals and is the coeditor of Children's Folklore: A Sourcebook, which won an American Folklore Society Opie Prize for Best Edited Book. The winner of the Chicago Folklore Prize for 2008 is a gripping, fully theorized first-person narrative by a folklorist who, mindful of the cultural risks involved, has worked for several years with members of a culturally endangered group, Sudanese Di Dinga war refugees relocated to the United States-"The Lost Boys." 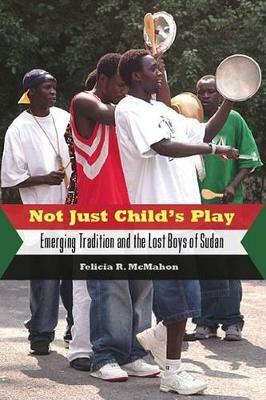 Felicia McMahon's Not Just Child's Play: Emerging Tradition and the Lost Boys of Sudan, published in 2007 by the University Press of Mississippi, shows that because of the dislocations of war in Sudan, The Lost Boys, though now grown, were never properly initiated into manhood according to tribal custom and so are caught in a state of cultural childhood. McMahon's work with the group in western New York State has been in large measure devoted to helping the refugees encompass that loss through recovery of remembered tribal dance and ritual enacted in public performances. The reader cheers the group on, honoring the Lost Boys' dance and ritual--transnational, cobbled-together, hybrid, but absolutely and authentically theirs.